The new Round But Square Studios — for kids and adults — encourages hands-on art appreciation and memorable creative moments. No one likes traffic. However, the silver lining is that traffic sometimes gives us time to think (before the kids have been picked up, at least). For Ashley O’Connor, sitting in Old Shell Road traffic was where she realized her dream of opening up a creative space could become a reality. While passing the series of small shops that neighbor Dreamland Bar-B-Que near the I-65 service road, she noticed they had recently been repainted white, giving them a whole new look. They fit her vision of what opening her own studio could be. In the six-month span from January to June 2018, this vision came to life as she acquired the space, gathered materials, and made her own workplace with the help of enthusiastic friends like Eugenia Foster and Alyce Heggeman Head. Today, the space is home to the brand-new Round But Square Studios. O’Connor has always had a passion for art. After graduating from St. Paul’s, she went to the University of Virginia, earning a bachelor’s degree in studio art and photography as well as a master’s in teaching. She then returned to Mobile to earn an additional bachelor’s degree in art education from the University of South Alabama. From there, her teaching career began at St. Paul’s, where she taught art and started a photography program that is still thriving today. Five years later, she moved to New Orleans with husband Henry to teach at the Louise S. McGehee School for eight years. In 2005, this all changed when Hurricane Katrina gave the family of five the opportunity to move back to Mobile, where they have remained ever since. 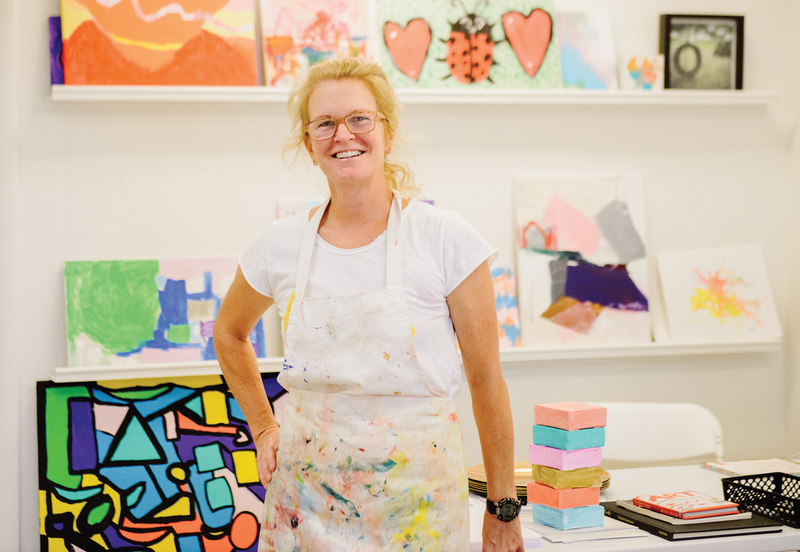 O’Connor’s motivation to open Round But Square was driven by the idea of providing a space for kids’ art classes, but also creating a place that people of any age could congregate to self-express and unwind, all while being inspired by the fine arts. She wanted to focus on giving local artists the chance to lead classes and share their own passions, whether that be in the form of painting, sculptures, mixed media works or even poetry. The studio can be rented as pop-up space for these artists to display their work and exhibit a show before moving to a larger space. After a successful summer full of camps, adult classes and dorm decor parties, Round But Square is looking ahead to see how it can continue to make an impact on the community. This fall, they will offer a variety of options to satisfy creative palates. Parties are available to book for any occasion: birthday, retirement, bridal, even Mardi Gras! One program women will want to pencil in is Girls’ Night Out. As she does with her kids’ camps, O’Connor will teach about various artists, emphasizing how their styles are all different. Since school has started up, Round But Square is also providing after-school classes as well as kids’ yoga to keep them active. Holiday activities will soon be up and running to give kids a wholesome alternative to screens, not to mention a chance to paint some homemade Christmas gifts for friends and family. Although the list of things to do at Round But Square may seem jam-packed, the studio is always open to ideas!